I’ve been to many YC Demo Days and I always look forward to them. This year was no exception. There are so many wonderful ideas and companies founded by terrific entrepreneurs. In addition to the pitches themselves, the types of companies presenting forbear trends in the startup world more broadly. To get a better sense of those trends, I’ve categorized more than 250 startups in 3 recent classes and plotted the evolution of the classes. The bar chart above shows that the split between consumer and enterprise has remained constant over these three classes. Healthcare companies, those focusing on drug discovery or deeper diagnostics have notably risen in number in 2015. This increase in activity seems to be driven by advances in data analysis for drug discovery and novel sensors. 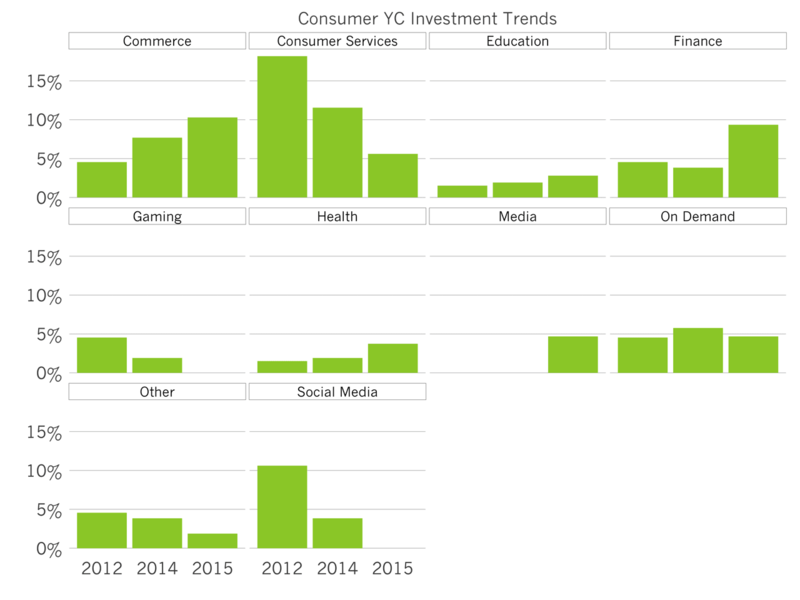 Looking into consumer YC startups more deeply, a few salient trends emerge. 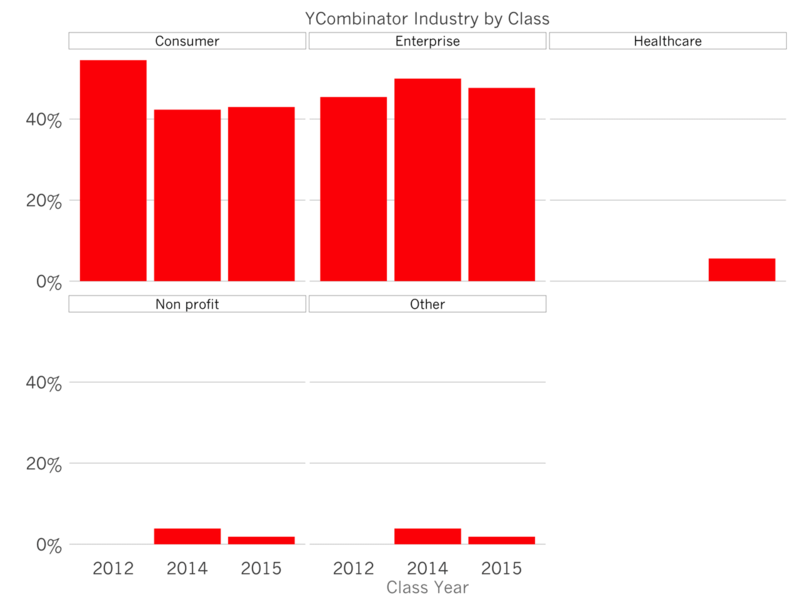 First, commerce startups have increased steadily, and represent 10% of the last class. This trend opposes the broader VC market’s investment patterns. Consumer services, which includes consumer search, dating, daily deals and others, have steadily declined, potentially because of increased competition in those categories. Startups pursuing consumer finance have popped recently, not driven by Bitcoin, but by a wave of founders bringing more sophisticated financial tools to the masses. Gaming is out of fashion, following the broader market. Surprisingly, media companies spiked this year, driven by a Twitch for X phenomenon. On Demand companies, both food delivery, services and logistics, are constant. Last the decline of social media investment is consistent with the rest of the market. Growth investors have been pursuing social media companies at twice the rate of seed stage investors. Turning to enterprise, collaboration tools have fallen likely dissuaded from entering the fray by the huge success of Slack and others. Financial management tools like expense management or receivables financing are growing steadily. 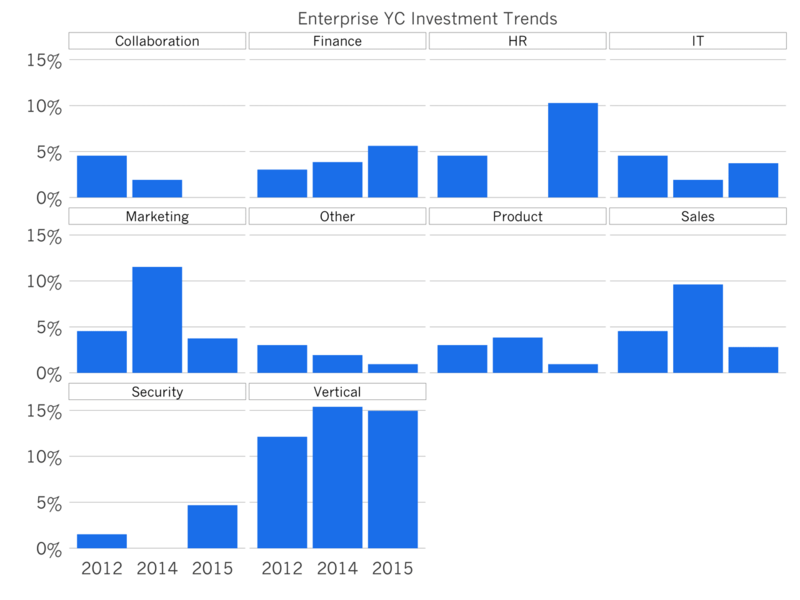 The important story in Enterprise YC companies is the prominence of vertical SaaS - e.g., construction, real estate and legal software - all industries who have yet to modernize and so present terrific opportunities to build big businesses. Last, sales and marketing software products have declined in popularity, also potentially because of the tremendous competition in those segments. One analyst counts more than 2000 software products catering to marketing teams, up from 1000 the year before. Demo Day is a window into the future of consumer and enterprise investments. If this data is any indication, we should see more commerce and consumer finance companies; and more vertical software businesses in the next few years.